Abstract: A small collection of manuscripts, mostly letters, relating to members of the Parsons and Williams families of late colonial Massachusetts. Preferred Citation: Parsons-Williams Family Correspondence Letters, Department of Special Collections, Hesburgh Libraries of Notre Dame. 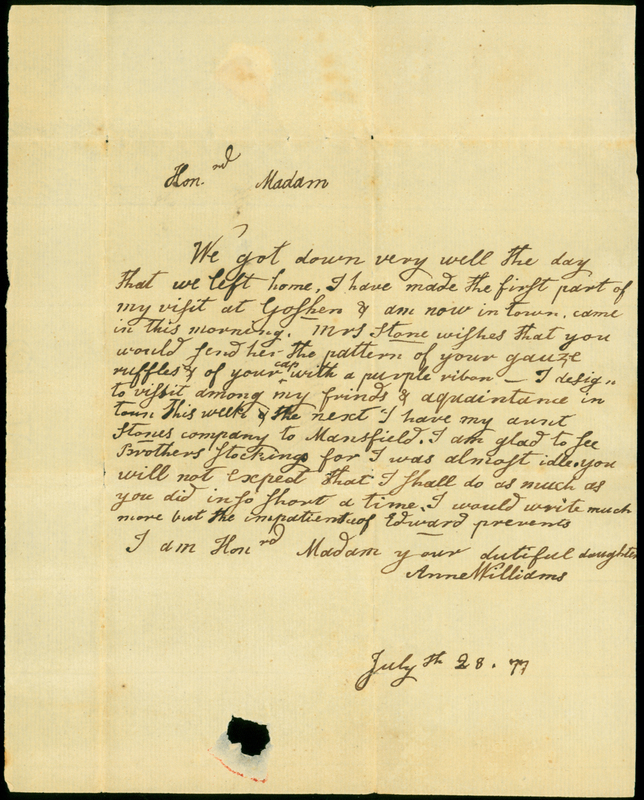 Acquisition and Processing Note: The Parsons-Williams correspondence was purchased by the Hesburgh Libraries in 2002-03, from Paper Trails of Charlton, Massachusetts. Arranged and described 2005, by George Rugg. Finding aid 2009, by Jacob Baska. The eleven letters in this collection were either written by or addressed to three members of the Parsons and Williams families: Rev. Joseph Parsons (1702-1765), his son Rev. Joseph Parsons, Jr. (1733-1771), and his daughter-in-law Sarah Williams (1737-1800). The elder Parsons graduated from Harvard in 1720 and served as minister in Bradford, Massachusetts from 1726 until his death in 1765. He and his wife Frances Usher had three sons; the oldest was Joseph, Jr., who followed his father to Harvard, graduating in 1752. In 1757 Joseph Parsons, Jr. was elected minister in Brookfield, Massachusetts. In 1763 he married Sarah Williams, of Waltham, Massachusetts. Williams' family background was not unlike her husband's; both her father and grandfather were Harvard-educated ministers. The couple remained in Brookfield and had one daughter, Sarah Parsons, born in 1764. The elder Joseph Parsons died in 1765, the younger in 1771. Sarah Williams Parsons remarried in 1777, to Eliphalet Williams, a Yale-educated minister from East Hartford, Connecticut. She bore two additional children before her death, in 1800. The collection consists of eleven letters and two records dating from 1757 to 1777. Six of the letters are directed to Sarah Williams (four from the years before her marriage to Parsons, one from the time of the marriage, and one from after Parsons' death). Most are from female friends or relatives. 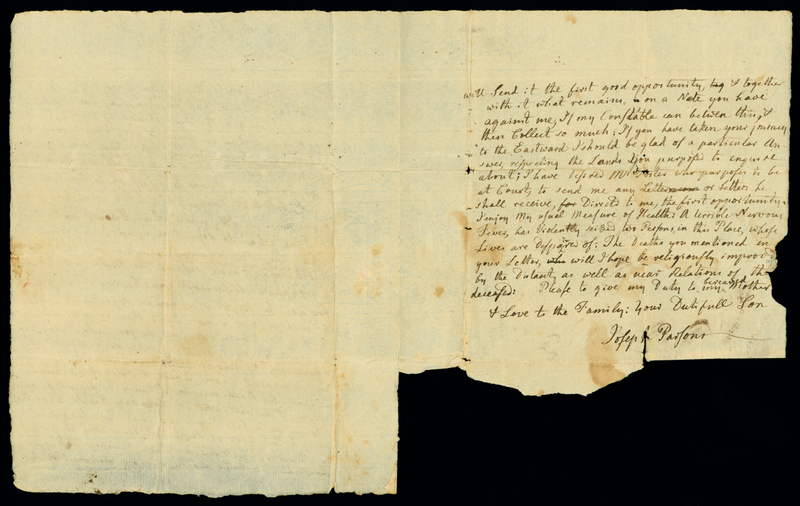 There are three letters from Joseph Parsons, Jr. to his father, mostly relating to land and debts. 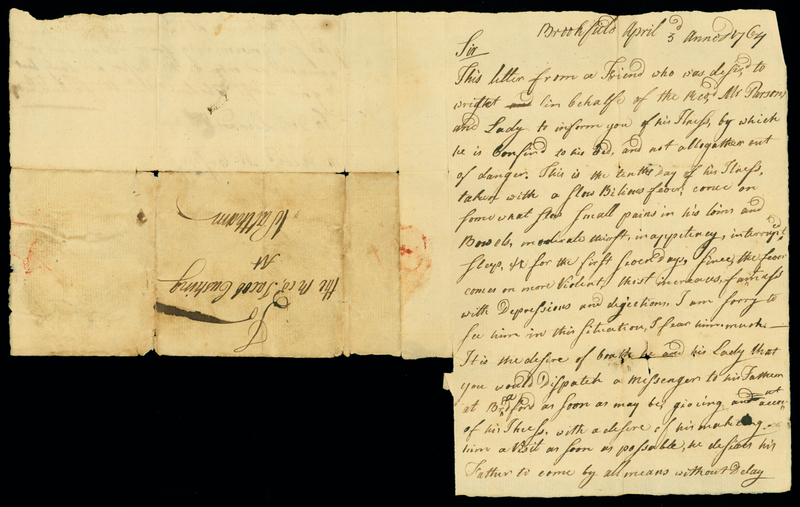 Two additional letters (April 1764) were provoked by the ill health of Joseph Parsons, Jr. There are also two records, one relating to Parsons Jr.'s election as minister of Brookfield, and one to his financial arrangements with his father. The collection is arranged by document type (letters, then records) and thereunder by date, one item per folder. Letter. 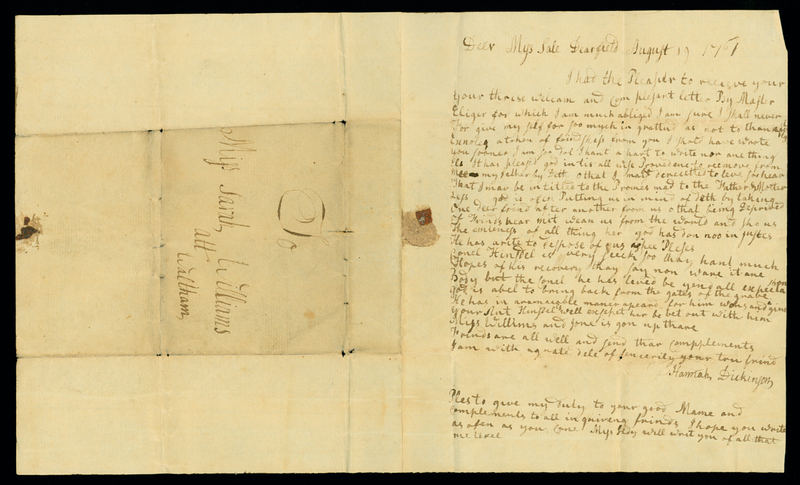 Abigail Williams, Waltham, Massachusetts, to Sarah Williams, Deerfield, Massachusetts, 1760 November 10. Folder 1 (MSN/COL 8501-1). ALS, 1 page (19 x 15 cm.) on 1 folded sheet, w/integral address leaf. A personal letter to Sarah Williams from her mother, Abigail Leonard Williams. At the time Sarah Williams was visiting in Deerfield, where her paternal grandfather, Rev. John Williams, was minister at the turn of the eighteenth century. John Williams, his wife, and seven of his children, including Sarah's father Warham Williams, were among those made captive in the famous Deerfield raid of 1703/4. 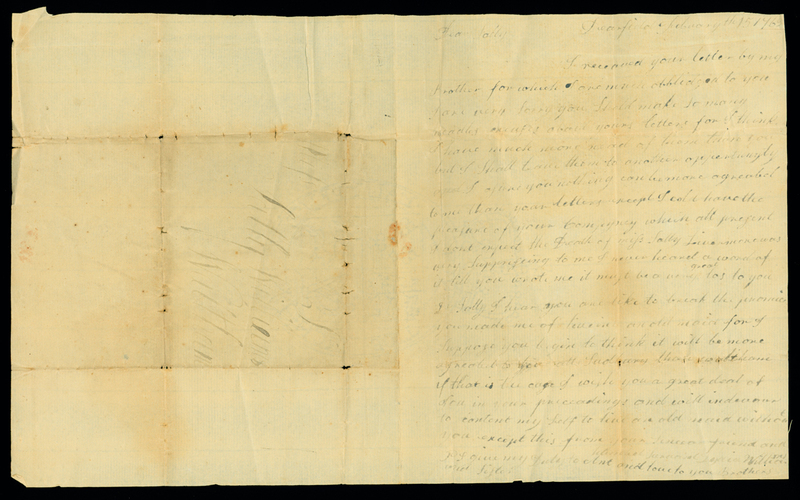 The letter includes a brief postscript in an unidentified masculine hand. Letter. 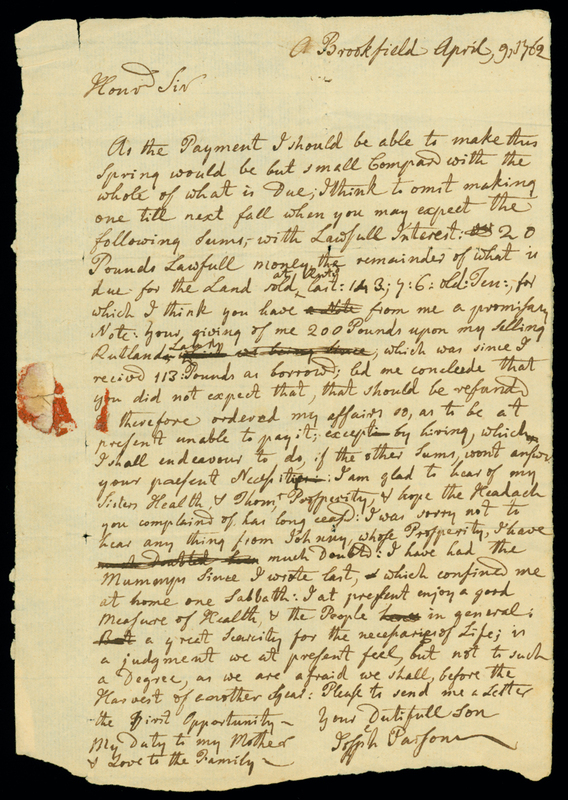 Hannah Dickinson, Dearfield [Deerfield], Massachusetts, to Sarah Williams, Waltham, Massachusetts, 1761 August 19. Folder 2 (MSN/COL 8501-2). ALS, 1 page (19 x 16 cm.) on 1 folded sheet, w/integral address leaf. A personal letter to Williams from a friend in Deerfield. 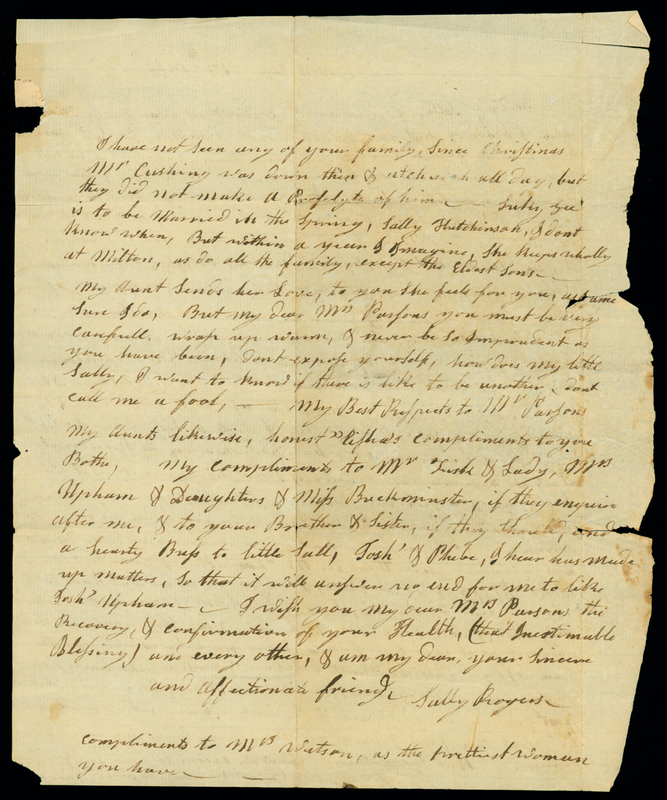 Dickinson acknowledges receipt of a letter and conveys family news, including the death of her father. Letter. 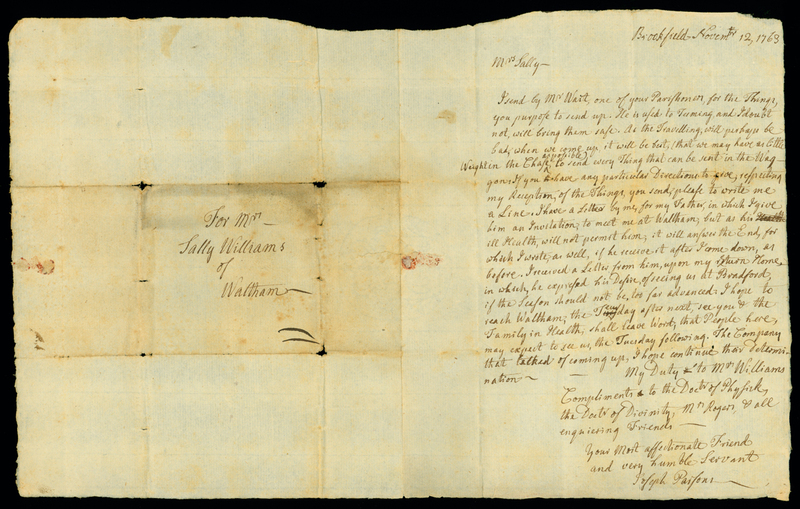 Lydia Williams, Dearfield [Deerfield], Massachusetts, to "Sally Williams" [Sarah Williams], Waltham, Massachusetts, 1762 January 15. Folder 3 (MSN/COL 8501-3). 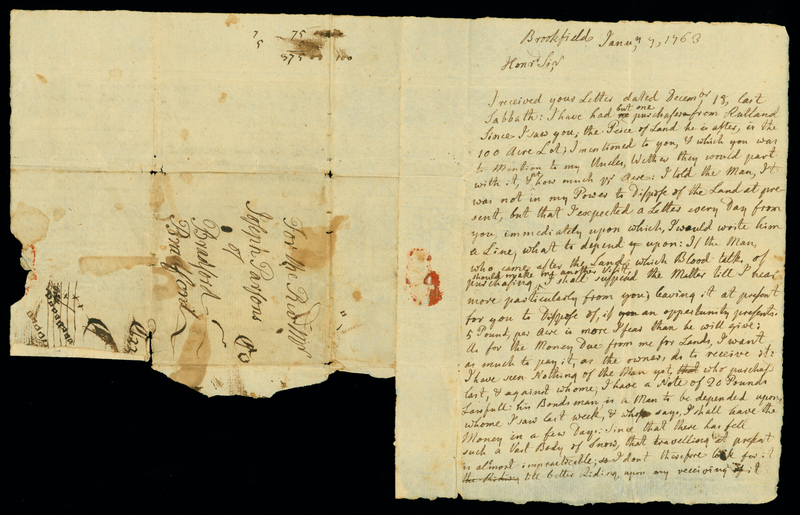 A personal letter from Deerfield: ". 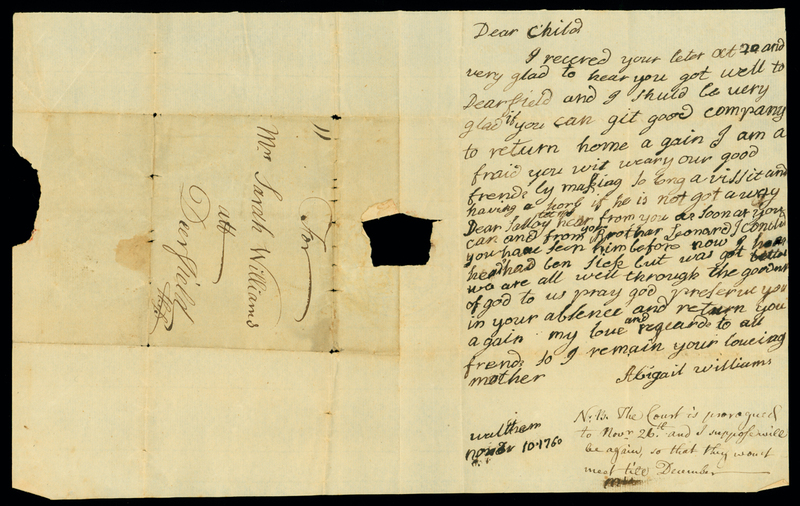 . . Sally I hear you are like to break the promise you made me of liveing an old maid . . . ."
Letter. Joseph Parsons [Jr.], Brookfield, Massachusetts, to "Honored Sir" [Joseph Parsons], n. p., 1762 April 9. Folder 4 (MSN/COL 8501-4). ALS, 1 page (20 x 14 cm.) on 1 sheet. The author explains that he will be unable to make a scheduled payment to his father for land in Rutland, Massachusetts; inquires after the health of his family; and describes his recovery from a case of the mumps. Letter. Joseph Parsons [Jr.], Brookfield, Massachusetts, to Joseph Parsons, Bradford, Massachusetts, 1763 January 7. Folder 5 (MSN/COL 8501-5). ALS, 2 pages (20 x 16 cm.) on 1 folded sheet, w/integral address leaf. 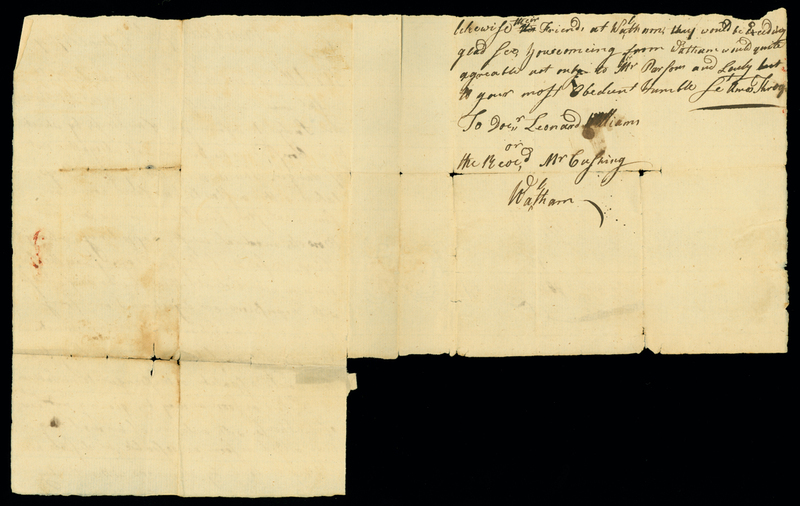 Parsons Jr. describes arrangements for selling a parcel of land in Rutland, Massachusetts, and more generally, of settling his debts to his father. Letter. 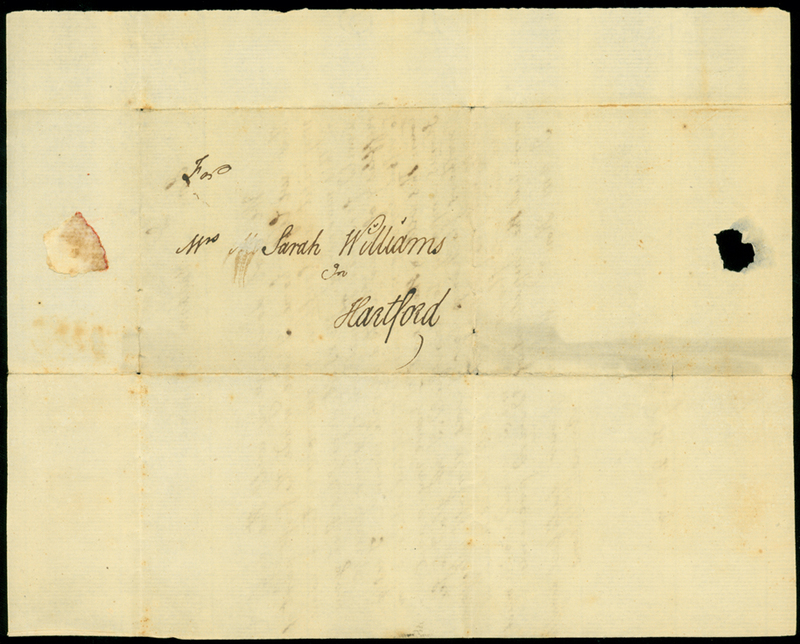 Joseph Parsons [Jr.], Brookfield, Massachusetts, to "Sally Williams" [Sarah Williams], Waltham, Massachusetts, 1763 November 12. Folder 6 (MSN/COL 8501-6). ALS, 1 page (20 x 16 cm) on 1 folded sheet, w/integral address leaf. Shortly before their wedding, Parsons, Jr. explains to Williams that he will send a teamster to pick up items she wishes to move to Brookfield. He also describes his father's poor health, and plans for his own arrival at Waltham. Letter. 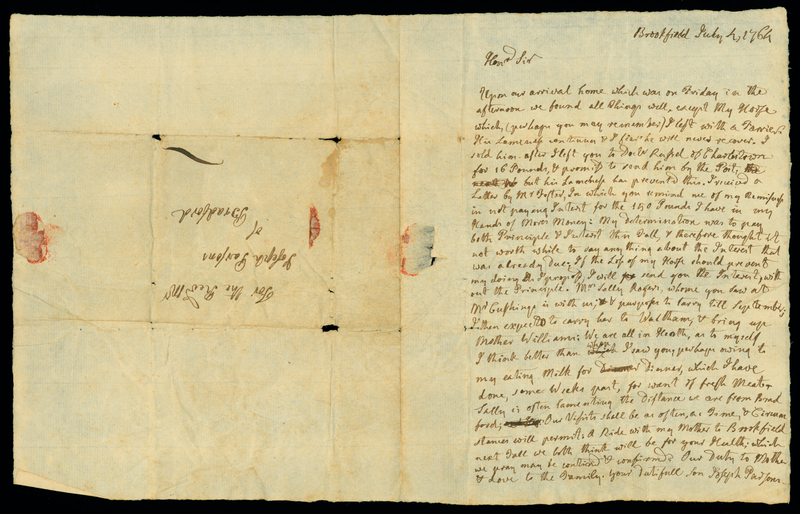 Amos Throg, Brookfield, Massachusetts, to Jacob Cushing, Waltham, Massachusetts, 1764 April 3. Folder 7 (MSN/COL 8501-7). ALS, 2 pages (20 x 16 cm) on 1 folded sheet, w/integral address leaf. 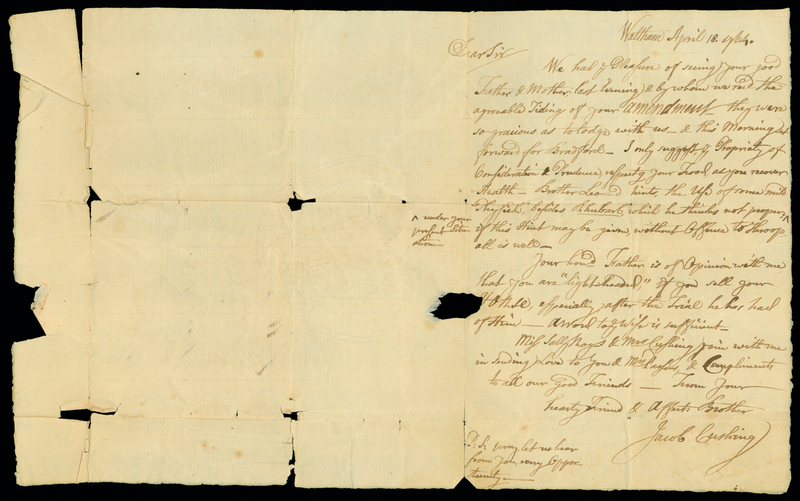 Writing on behalf of the ill Joseph Parsons, Jr., Throg requests that Cushing send a messenger to Joseph Parsons, asking the latter to come to Brookfield without delay. Letter. 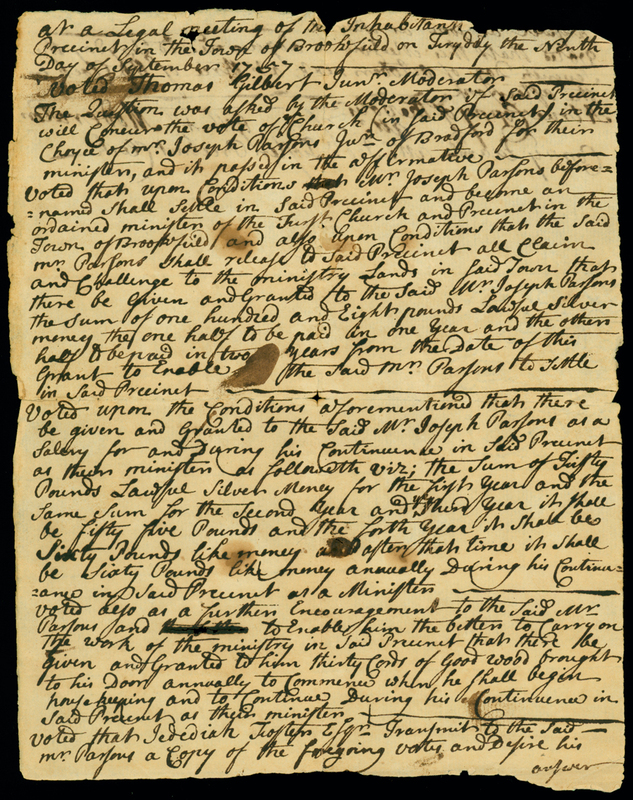 Jacob Cushing, Waltham, Massachusetts, to "The Revd Mr. Parsons" [Joseph Parsons, Jr.], Brookfield, Massachusetts, 1764 April 18. Folder 8 (MSN/COL 8501-8). Cushing writes Parsons, Jr. to inform him that Parsons and his wife have just left Waltham and are traveling towards Bradford. "Brother Leonard"—Sarah Williams' brother—recommends that Parsons, Jr. use some "mild Physick" to alleviate his illness. Letter. 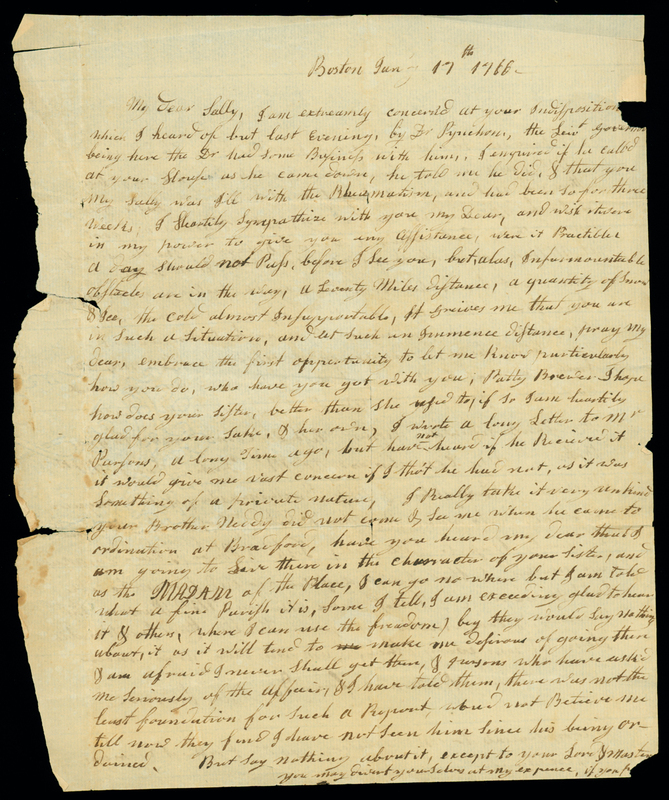 Joseph Parsons [Jr.], Brookfield, Massachusetts, to Joseph Parsons, Bradford, Massachusetts, 1764 July 4. Folder 9 (MSN/COL 8501-9). More on Parsons, Jr.'s plans for settling his debts to his father, and news of his health following his illnes of the spring. Letter. Sally Rogers, Boston, to "My Dear Sally" [Sarah Williams], n. p., 1766 January 17. Folder 10 (MSN/COL 8501-10). ALS, 2 pages (23 x 19 cm) on 1 sheet. Rogers expresses her concern at Williams' recent diagnosis of rheumatism; discusses family and mutual friends; and asks for further news. Letter. Anne Williams, n. p., to Sarah Williams, Hartford, Connecticut, 1777 July 28. Folder 11 (MSN/COL 8501-11). ALS, 1 page (23 x 19 cm) on 1 sheet, w/address on verso. A letter from Sarah Williams' step-daughter, Anne, regarding current visits with family and friends. Town Meeting Minutes. Brookfield, Massachusetts, 1757 September 9. Folder 12 (MSN/COL 8501-12). ADS, 2 pages (20 x 16 cm) on 1 sheet. 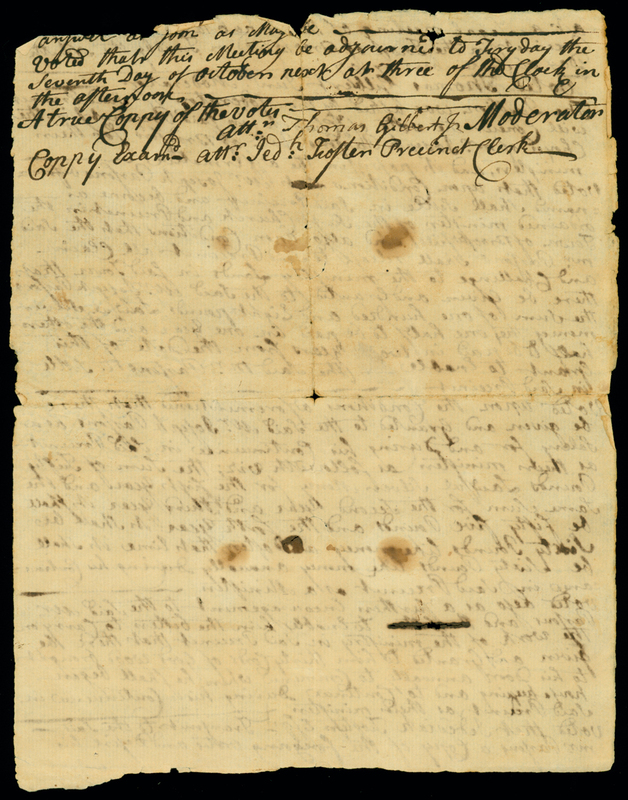 Joseph Parsons, Jr.'s copy of the minutes of the Brookfield town meeting in which he was elected minister (September 1757). The minutes outline conditions to which Parsons must agree before acceptance, and stipulate his remuneration. The document is in the hand of precinct clerk Jedediah Trosten. Receipt. Joseph Parsons, Bradford, Massachusetts, 1759 November 30. Folder 13 (MSN/COL 8501-13). ADS, 1 page (10 x 16 cm) on 1 sheet. 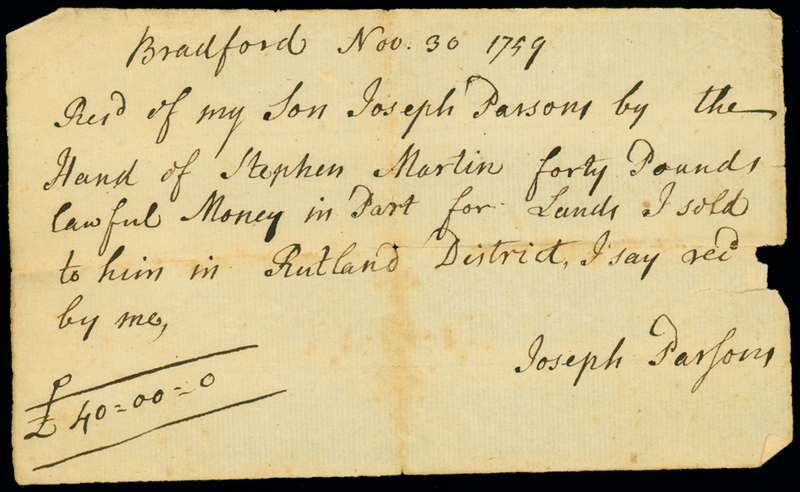 A receipt written and signed by Jospeh Parsons indicating that Joseph Parsons, Jr. has paid his father £40 for land purchased in Rutland, Massachusetts. This may be the land referred to in items 8501-4 and 8501-5.